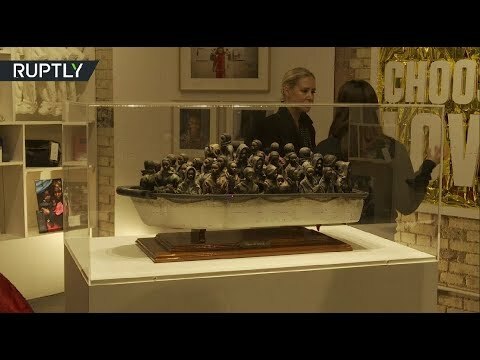 Banksy’s ‘Dream boat’ sculpture of refugees displayed for charity in London | We Seek the Truth! A sculpture of refugees fleeing in a dinghy, created and donated by the British street artist known as Banksy to the ‘Choose Love’ charity store in London, was put on display on Tuesday. The sculpture, which was reportedly a part of the artists’ theme-park Dismaland, will be on display at the charity store until December 22. According to Tom Steadman – head of communications at Help Refugees, which runs the store – visitors will have the chance to win the sculpture by donating a ‘minimum’ two pounds and guessing its exact weight.